I was recently watching "EasyJet: Inside The Cockpit" and it said pilots need 4 shoulder stripes to land at Heraklion International Airport, “Nikos Kazantzakis” (IATA: HER, ICAO: LGIR), but it didn't explain why they need the extra experience. Could someone please explain? Category B translates roughly as "slightly out of the ordinary". A good example, according to Captain Martin Dudley, A300 fleet manager for Monarch, is Lanzarote: "There's a little bit of ground on the extended centre line that just comes into play in terms of our performance calculations for take-offs, and that makes it a 'Cat B'. There are a fair number of those." The UK's biggest airline in terms of passenger numbers, easyJet, classifies Corfu, Dubrovnik, Heraklion, the Isle of Man, Jersey and Rome's second airport, Ciampino, as Category B. It came up in the documentary (easy find thanks to searching through the automatic YouTube caption system) when a medical emergency made the crew check the alternate airports on the way, of which Heraklion, was classified by easyJet as captains only. The theme of the series seems to be pilots in training. They couldn't choose it because if the captain became ill, then the first officer would not be allowed to continue the approach. The crew received the latest weather report showing a crosswind that is gusting to 24 knots (if it's been gusting 34 knots then maybe it could have warranted the drama). The crew consists of a senior first officer, Carl, and the captain is Chris Foster, the company's operations manager. Carl wanted to impress, but [due to company policy] the captain has to make the landing in those crosswind landing conditions, thus robbing Carl the chance to impress and gain experience toward getting his fourth-stripe (this is literally how they present it—a recurring theme in the show as far as I can tell). Nonetheless, there are tricky approaches out there, like London City, or Kai Tak (RIP). And many others where special training and approval are required. Added safety is not bad, even if it's for tricky windy conditions where experience and additional training do make a difference. 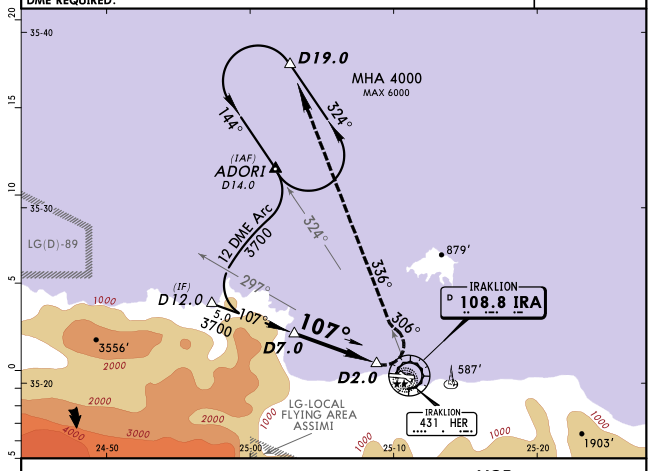 Heraklion is regularly included in a list of the Scariest/Most challenging/Unique (pick your adjective) runways in the world. Also known as Lukla, the Himalayan airport is renowned for having one of the most feared runways in the world. Built on a steep incline in the middle of the Himalayan Mountains, it’s a mere 1500 ft. long and 65 ft. wide! There is no obvious reason why Heraklion would be included. Today it is not a particularly short or narrow runway, it has many thousands of movements per year and is the second most busy airport in Greece. It is a military airbase, and as such there could be frequent military movements, which could mean frequent diversions of civilian air traffic - but there is no particular evidence of this that I could find. A quick look at satelite imagary shows the runway in the proximity of mountainous terrain, but nothing which appears to require particularly complex routing on approach/final. All in all I would say this is the usual kind of embellishment with entertainment shows regarding Aviation (Just last week on this show - Stalling: When the engine stops! My eyes nearly rolled back into my head). A "4 stripe pilot" usually just means that he/she holds the rank of Captain for the airline. Its pretty standard fare to have a "4 star pilot" on board most flights. Like a lot of things on the TV programme it was glossed over and out of sequence. It is captains only due to terrain, weather, circling 09, lighting or lack thereof, upslope. Distractions during high workload visual approaches (this can mean checklist items are missed). Visual illusions lead to PITCH alerts and firm landings due to low level environmental conditions. RWY is upslope (causing ground rush effect), and there are variable RAD ALT callouts. There are no approach lights on RWY27 as the approach is over the sea, this creates a “black hole” effect which is exacerbated by any further downgrade of the lighting. Turbulence and downdrafts are common. Taxiways Delta and Golf for RWY27 departures are not well illuminated and are easy to miss. The final approach to RWY09 is made over the town; there is a church 250 m short of the RWY and the considerably displaced threshold; no instrument approach is published. Expect to circle from an approach to RWY27 or take vectors to a visual left base. On most days this is a simple destination but there are potentially multiple tricky things so it is considered less risky to always have the captain perform the landing. Not the answer you're looking for? Browse other questions tagged airline-operations airport-design crew or ask your own question. Why does the F-35 Lightning II have only 1 crew when the F/A-18 Hornet had 2?